The results of the tenth campaign of the Cross-Language Evaluation Forum (CLEF) were presented and plans for CLEF 2010 were unveiled at the annual CLEF workshop, held this year in Corfu, Greece. The objective of the Cross-Language Evaluation Forum (CLEF) is to promote research in the field of multilingual information access (MLIA) research and development. This is done through the organisation of annual evaluation campaigns offering tasks designed to test different aspects of mono- and cross-language information retrieval systems. The aim is to encourage the development of next generation multilingual multimodal information retrieval (IR) systems. Participation in the CLEF initiative has increased steadily over the years, growing from just 20 research groups in CLEF 2000 to more than 150 groups this year, mainly but not only from academia. Most of the participants in CLEF 2009 were from Europe, but there was also a good contingent from North America and Asia, plus a few from South America and Africa. In addition, CLEF collaborated in the organisation of Morpho Challenge 2009, an activity of the Pascal Network of Excellence. A main result of the CLEF campaigns is the creation of a number of valuable, reusable test collections consisting of data in many languages and diverse media (text, image, speech and video) which are made available for system benchmarking purposes. As usual, this year's workshop was held in conjunction with the European Conference on Digital Libraries. The CLEF workshop was attended by 160 researchers and system developers, who presented their experiments and results in lively plenary, parallel, poster and breakout sessions. There were several invited talks. Noriko Kando, National Institute of Informatics Tokyo, reported on the "Evolution of NTCIR", an evaluation infrastructure testing Information Access technologies for Asian languages) and Jaap Kamps of the University of Amsterdam presented the main outcomes of a SIGIR workshop on the "Future of IR Evaluation". In a concluding talk, Donna Harman, US National Institute of Standards and Technology, summed up what she felt were the main achievements of CLEF over these ten years of activity. The presentations given at the CLEF 2009 Workshop and detailed reports on the experiments of CLEF 2009 and previous years can be found on the CLEF website. CLEF 2009 has represented an important milestone for the MLIA community. After ten years of activity focused on stimulating the development of MLIA systems and functionality through the organisation of increasingly complex evaluation tasks, it is now time to assess achievements and to identify priorities for the future. For this reason, it has been decided to change the format for next year. CLEF 2010 will take the form of an independent, peer-reviewed Conference organised in conjunction with a set of Evaluation Labs, each running experiments aimed at testing performance in MLIA-related areas. The Conference will be held in Padua, Italy, September 2010, as a four-day event. The first two days will consist of plenary sessions in which keynote speeches and peer-reviewed papers will be presented. The goals will be to explore current needs and practices for information access, study new evaluation metrics and methodologies, and discuss new directions for future activities in the European multilingual/multimodal IR system evaluation context. In Days 3 and 4, the results of the Labs will be presented in full and half-day workshops. 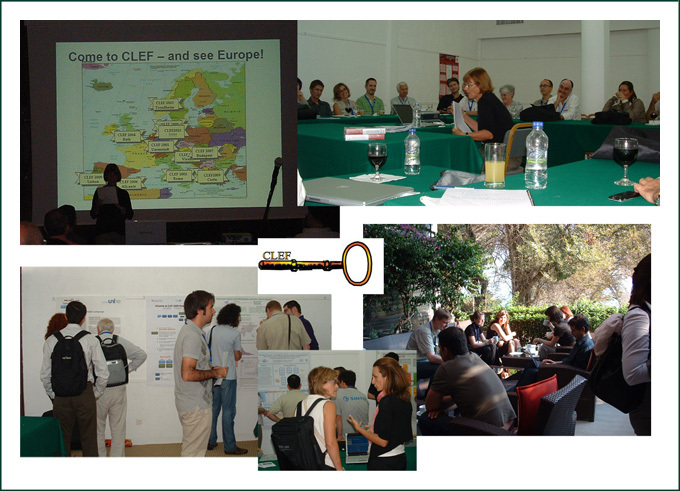 CLEF 2008 and 2009 have been sponsored by the TrebleCLEF project: Evaluation, Best Practices and Collaboration in the Multilingual Information Access domain. The first Calls for Proposals for the organisation of Evaluation Labs and the preliminary Call for Papers for the submission of scientific papers to the Conference will be posted on both the CLEF and the TrebleCLEF websites.